At 12:14 on a recent Wednesday afternoon, Tevis Bartlett makes a left turn in Nathan Hale High School’s spacious second-floor hallway and arrives at Room 2139. It’s a route, and routine, he knows well. A little more than hour earlier inside the Husky Stadium locker room, after wrapping up another two-plus-hour morning practice, he had changed out of his No. 17 jersey and into attire more fitting for his daily afternoon internship. 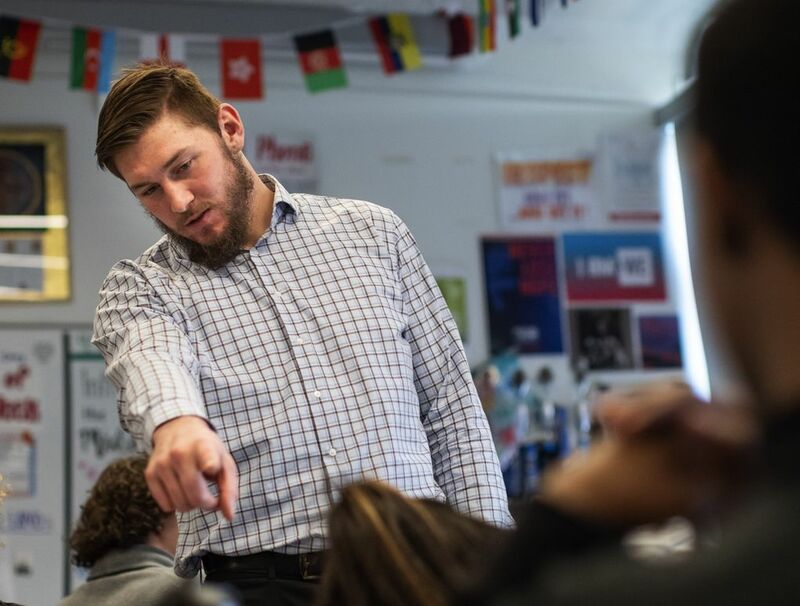 In his black dress pants, black belt, matching shoes and light-blue checkered shirt, he is transformed from starting linebacker for a Top 25 college-football team to a more buttoned-up role for the 27 students in Nathan Hale’s American Government class. In Room 2139, he is simply Mr. Bartlett. Inside Ms. Magic Demirel’s classroom, organized chaos greets Mr. Bartlett on this particular day. Really, it’s just loud, a handful of conversations happening all at once in all corners of the room. It’s like this most days at this hour, Mr. Bartlett says, because Ms. Demirel’s class is a popular hangout for all kinds of students. Some 50 of them are in here during this 30-minute lunch period, and on any given day Ms. Demirel welcomes three different student clubs in her room. Today, the Mock Trial Club is gathered on one side of the room, and the Jewish Student Union Club is gathered around one cluster of desks, boxes of doughnuts and bagels passed around the group (and politely offered to visitors). Other students sprinkle in and out of the classroom. Some wait in a short line to use Ms. Demirel’s microwave. Others relax on the couch on the far wall underneath the large window (one of those seated is Jaedin Johnson, the younger brother of defensive lineman Jaylen Johnson, one of Bartlett’s senior teammates with the Huskies). “This is where everyone wants to hang out,” Mr. Bartlett says. He has found a home here, too. And a calling. Only now does Tevis’ future as a full-time educator — and, almost certainly, as a coach — seem obvious to him. When he arrived at UW three-and-a-half years ago, he was initially interested in a business major. That path veered off course once he enrolled in a 200-level economics class. He had always been interested in history, but that didn’t stick as a major, either (though it did as a minor). 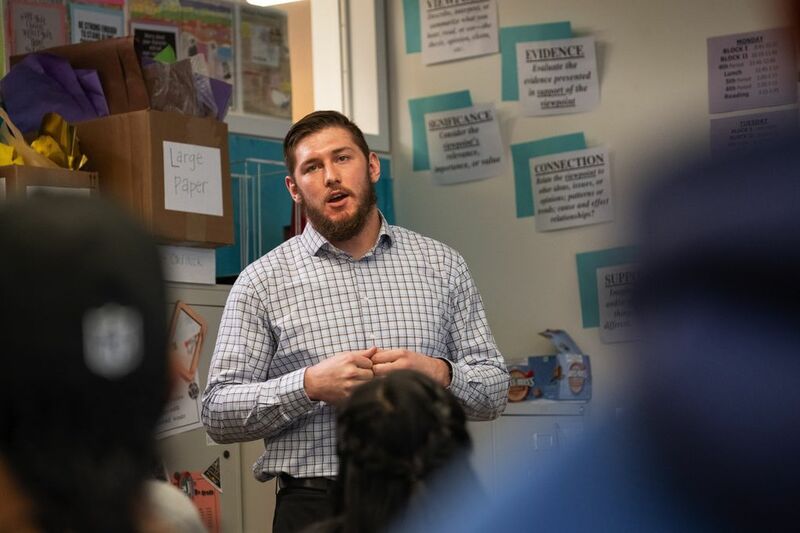 Around that time he became an assistant wrestling coach at Cedar Heights Middle School in Covington, and that’s when the idea of pursuing a career as a teacher really took shape. And it’s a natural fit: His parents are both educators back home in Wyoming. 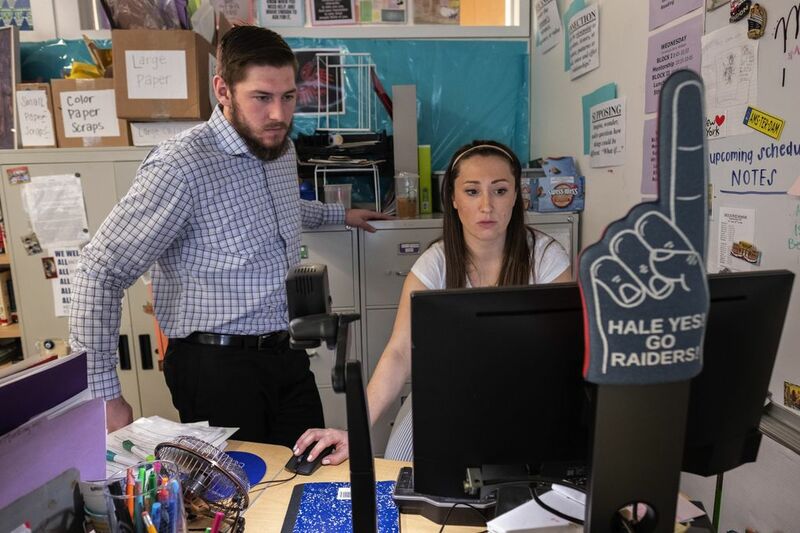 His father, Dave, is an assistant superintendent in the Laramie County School District; his mom, Fawn, is an associate principal at Cheyenne’s East High School. The oldest of three Bartlett boys, Tevis was a 4.0 student at East High, ranking first in a senior class of 348. He was a two-time academic All-American, a four-time state wrestling champion, a two-time national-champion wrestler, and a three-year starter at quarterback, leading the Thunderbirds to a state title as a junior. As charmed a high-school experience as one could have, right? In them he found examples of the kind of educator he wants to be, of the kind of influence he hopes to have as an educator and coach. Soon after Mr. Bartlett enters the classroom on this early afternoon, Ms. Demirel asks if he knows Chinese — or, at the very least, how to get rid of these Chinese symbols that have suddenly taken over her Microsoft Word document. Is this the work of a mysterious hacker? Some playful senior prank? Just a glitch? Mr. Bartlett saddles up next to Ms. Demirel’s computer. He makes a few clicks with the mouse and stares at the screen for a minute. Hmm, nothing. He can’t figure out what happened either. This throws a small wrinkle in the planning for their senior-level American Government class, which begins after lunch at 12:50, 25 minutes from now. There’s a simple solution: Instead of listing the daily reminders in the Word document (which is then transposed onto the large white screen at the front of the room for all to see), Mr. Bartlett will have to walk the class through the bullet points before students resume a group project. Lunch ends, and the seniors all eventually take their seats. Ms. Demirel confiscates an iPhone from one shaggy-haired student, then gives the floor to Mr. Bartlett. 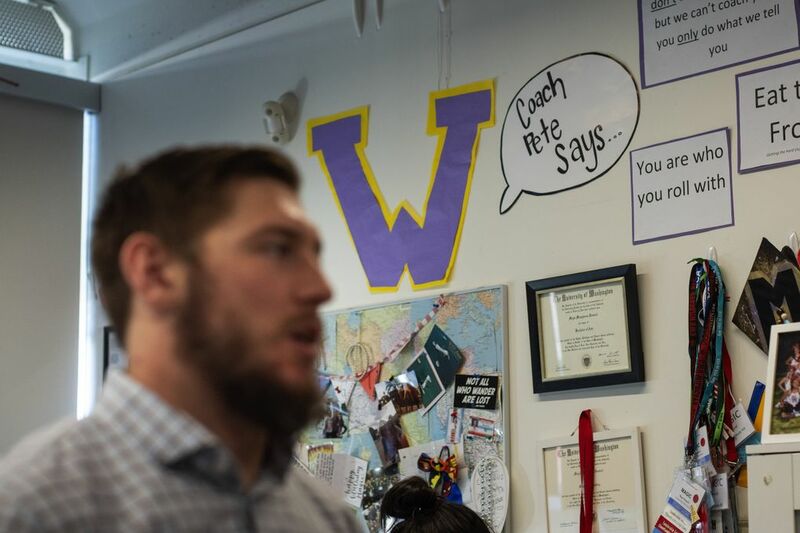 The wall behind Ms. Demirel’s desk is decorated with printouts of “Coach Pete sayings.” In four seasons playing for Chris Petersen, Tevis says he has filled notebook after notebook with lessons and slogans from the coach. — Eat the frog (get the hard stuff out of the way). — What’s done in the dark will come to light (if you’re doing something wrong, it will always come out sooner or later). — You are who you roll with. — We can’t coach you if you don’t do what we tell you, but we can’t coach you if you only do what we tell you. — Writing crystallizes your thinking (helps you remember and stay energized). Tevis has been one of the steadiest players for the Pac-12’s top-ranked defense this season. He is the Huskies’ second-leading tackler, with 62 total, including three tackles for loss plus three forced fumbles. Still, most of the students in Room 2139 don’t recognize him as No. 17 from Husky Stadium. “They only know me as Mr. Bartlett,” he says. Those students who know he plays for the Huskies, who recognize he has a decent chance next year to play professionally, have asked him point blank: Why bother with teaching, man?